Call Nepal now with our cheap calling rates. Nepal has about 2 million mobiles and an impressive number of landlines. This is one of the reasons why Nepal is becoming a top destination for global VoIP calls. simplecall brings you a cheap international calling service to Nepal that opens the gateway of the Himalaya. We created this high quality calling service with your needs in mind. With simplecall, you can enjoy our top quality PINless service at a very low cost. And with our simple billing system, you can keep track of your calls anytime, anywhere. There is a decent amount of Nepalese living in the US and they have a strong bond back homewith their families and friends. simplecall understand this and that is why we want to make sure that you can be in touch with them. So we provide amazingly low rates for making calls to Nepal, starting at just 16.13¢ /min for landlines and mobiles. And remember, we are not like many of our competitors who have hidden charges and advertised minutes that aren’t genuine. 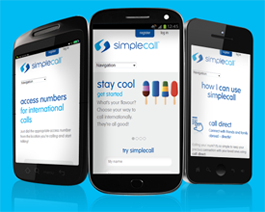 With simplecall, you only pay for what you use. To start using our service all you need to do is visit www.simplecall.com and register. The registration is free and quick, so you can start enjoying the benefits of being a simplecall customer in no time! Mountainous challenges ahead, keep marching. Nepal has endured a great deal because of the revolts, but now Nepal is rising and its economy is making healthy progress. Nepal evokes the image of fearless Ghurkhas and an unbroken mountain chain in our mind, but the country is more than that. A rich blend of distinctive religion and society has made Nepal lavishly unique. An uneven nation of great mountain peaks, notably the largest in Mt. Everest, has transformed it into a hub for visitors from everywhere throughout the world.